Development Plans for 3619 Georgia Avenue Filed with BZA | Park View, D.C.
Princeton Place elevation from BZA application for 3619 Georgia Avenue. There’s been speculation as to what development at 3619 Georgia might look like since October 2013 when an Ellisdale sign went up on the current structure. The waiting for what is proposed for the site is now over, as the Warrenton Group filed plans with the Board of Zoning Adjustment on Friday, August 8th. According to the materials and plans included with the application, the Warrenton proposes to demolish the existing structure on the Site and to construct a new mixed-use building with cellar and ground floor retail and 27 residential dwelling units. The project will include a total of 22,555 square feet of gross floor area, with approximately 23,518 square feet of gross and cellar floor area devoted to residential uses and approximately 2,911 square feet of gross and cellar floor area devoted to retail uses.In looking over the plans, the building will be 6-stories with what appears to be a roof terrace. In looking at the breakdown of residential units, the plans show 5 units that are 1-Bedroom with den; 5 units that are 2-Bedroom; 15 units that are 1-Bedroom; and 2 Duplex units. As this project is seeking zoning relief related to parking, it will be a matter that comes before Advisory Neighborhood Commission 1A. As it goes through that process, I’m sure many more details will be learned and I’ll keep everyone posted as new information becomes available. This entry was posted on August 11, 2014 at 7:01 am and is filed under Architecture, Development, Housing, Retail. You can subscribe via RSS 2.0 feed to this post's comments. Looks great. Certainly an improvement over what used to be there. Onward and upward, Park View! Really excited about this. Hope the ground level retail includes a dry-cleaner! Great news for Park View! Love hearing about new developments. It looks gigantic, not only compared to the adjacent Princeton Pl buildings, but even compared to the Georgia ave adjacent buildings. The parking zoning relief request is less than thrilling. Granting those should be rare, not systematic. I agree with pru. It does seem like it will stick out considerably. Especially with the loss of those trees. Too bad it can’t be in the place of those businesses on the other side of the church. Would you prefer another nail salon on hair braiding place? Maybe a liquor store? Is there a way to save mature trees along the streetscape when large development occurs or is that unrealistic given construction requirements? Hope trees can be saved as much as possible, however. I wish the current zoning permitted a larger building but this is better than the current situation. The area needs more density and foot traffic. Kent: please support the parking zoning relief and any additional zoning relief that the developer asks for. I’d also love the the ANC to support upzoning Georgia Avenue in general. More foot traffic? This isn’t lower Georgia Ave. I urge you to frequent this are more if you think foot traffic is a problem. I think there is a valid concern over parking. I’m sure the potential 30+ residents won’t all not have cars. I’ll withhold my full support until more details emerge. Hoping the developer maintains a brick structure in the floor to retain the character of the area years ago. We dont need a new modern structure that looks out of place in the middle of Georgia Avenue. Instead the building most balace the character of the newbuilding contructions in the area such as Safeway and the buildings over the metro. . I attended the developer’s presentation last night and there was no consideration expressed by the developer for any acknowledgement or consideration to the building’s relationship to the surrounding neighborhood. What was evident was than developer’s disregard and their intention to squeeze every nickle out of the space that they possibly can within zoning regulation, as is their right, but there is obvious blatant disregard for the neighborhood itself. Aside from the above, the reality is that the developer *NEVER* had any intention of providing any parking for tenants of the building. Their whole game plan has entirely revolved around the assumption that a parking variance would be granted and the surrounding neighborhoods Princeton, Quebec and Otis would absorb their parking liability, leaving them to rake in all the money that they possible can while skating this basic responsibility in any already overwhelmed area. > The community meeting with the developers for Thursday, Sept. 25th, beginning at 7 p.m. This meeting will be held at the Park View Recreation Center. > The next ANC 1A on October 8th, I believe at Harriett Tubman, when the vote on the variance will take place. Just be aware that whatever song and dance these guys do to try to convince the community that they have your best interests at heart, they are working something out with someone somewhere to provide off site parking or alleviate their parking debt, and or that they’ve done studies to indicate that our perceptions that parking in our neighborhood is not as bad as we think it is (yeah, right, tell me that when I’m trying to find a parking spot on my block at 10:00pm or on street sweeping days) – once that building goes up it is up, and any hat-in-hand, smoke-and-mirrors, dog-and-pony show that was performed to get the parking variance is moot, and we will likely be negatively impacted by this venture lining the pockets of a few people in perpetuity. Oh yeah, and that’s not even taking into account the future build-to-the-limit, maximize-the-buck ventures that are ultimately come down the road as the area ‘gentrifies’. Whatever your feelings are in this scenario, you should make your feelings known to your community representative(s), and encourage your neighbors to do the same. To me, this is outrageous and I would hope that residents in our neighborhood are aware of what’s going on and are giving this matter and its potential impacts due consideration. Will these be condos or apartments? As a homeowner on Princeton Pl with no off street parking, I am not happy with this development at all. The building does not fit in with the neighborhood. I’m interested to hear what the developer’s have to say. I fully agree with ‘not happy’. I live on the 700 block of Quebec Pl and will be somewhat directly impacted by any bad decisions in regards to variances and legislation made here. 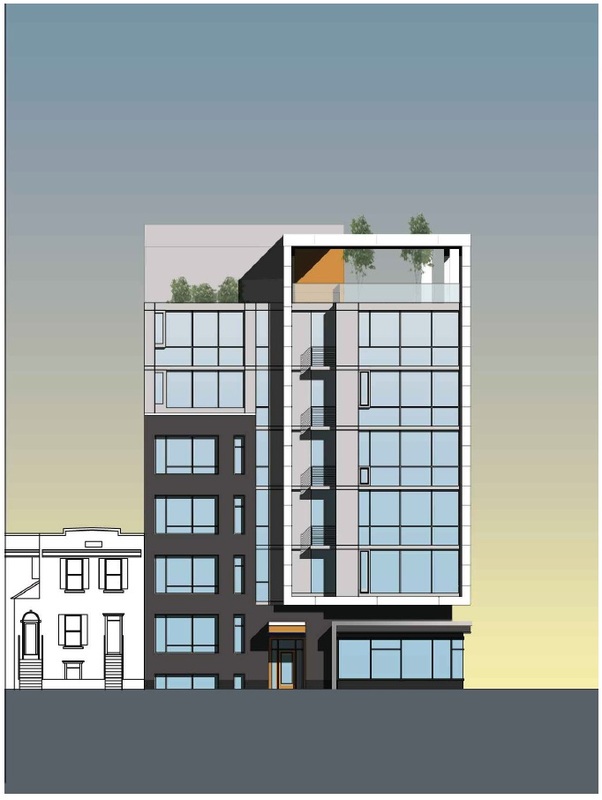 The proposed building as illustrated is a monstrosity in relation to everything around it, and any parking variance will be absorbed by increasingly overcrowded surrounding residential street parking. With all due respect, if you are not directly affected by this you have no reason to be chiming in. Wave your flag when this pops up down the street from your house. Every one of my neighbors that I have discussed this with over the last couple of weeks, since there was an article in the Park View paper recently discussing this matter, is very opposed to the parking variance particularly. The building illustration is also somewhat offensive, but if it falls within regulation it is an unfortunate reality that we will likely have to live with more and more as the neighborhood continues to blow up and becomes less neighborhood oriented and more renter and condo oriented. I think that most residents would like better retail and less after-dark sketchiness along Georgia Ave, but with the influx of bigger and grander residential pigeon-holing in the corridor, there seems to be a blind eye being turned towards sane balanced development south of New Hampshire Avenue. New businesses (at least various small business ventures that I have spoken to who would like open shop in the corridor, but simply can’t make the numbers work) can’t afford the speculative rental rates, so it seems that we are somewhat doomed to more of the same. If nothing else, we as residents – who actually plan to live here long term, and are not tourists stopping through for a quick flip – must at least be involved as much as possible where we can to help steer a sane direction for our community and prevent these code and zoning variances from skirting by undetected, which will impact out quality of life for decades to come. This is a critical point in the history of Park View, so please be involved in being part of the direction of it’s evolution. Kent Boese is an excellent advocate and representative for our neighborhood, not all regions in DC are so fortunate. There will be a presentation by the developers at the Sept. 10th meeting of ANC 1A. That presentation will likely occur around 8 p.m. (the meeting starts at 7 p.m.). The meeting is located in the cafeteria of the Tubman Elementary School (entrance through the parking lot on Kenyon). There is also a community meeting scheduled with the developers for Thursday, Sept. 25th, beginning at 7 p.m. This meeting will be held at the Park View Recreation Center. As a 13 yr home owner in Park View, I welcome “good” development. HOWEVER, as the owner of the little house depicted in the drawing, I must say that I am NOT happy about this development. When I purchased my home back in 2001, I was happy to be on the corner of Georgia Ave & Princeton PL. I get lots of natural sun light from my windows on the west side of my home. This giant of a building will block ALL of my windows on the west (9 windows). My home ON the corner of Georgia Ave and Princeton PL will forever be banished from sun light and it will become the home IN the corner….a cold dark corner.